Well, it's that time of year again. When MLB sanity goes out the window in the search of the perfect new toy. It seems now, more than ever, player salaries are skyrocketing. Personally, I don't generally mind players getting paid large salaries, because the alternative is the money goes into the owner's pocket. Given the choice between paying the hard working player a substantial wage or placing the increased revenue in the pocket of an owner who did little more than turn a profit with a business that's a legal monopoly, I tend to favor paying the players. That said, it really does seem like salaries are getting out of control. Professional athletes aren't just getting rich, but are now joining the super rich. At the end of his career, Alex Rodriguez could likely buy a baseball franchise, or at least the majority share of one. All of this got me to thinking about salaries and trends, so I took a look at MLB salaries over the past couple of decades to identify the real trends. Over the past ~21 years, on average player salaries in MLB rose ~10.0% on an annual basis. Of course, it's never quite that simple in baseball, because there was so much happening behind the numbers. There were a number of forces driving the players salaries up and down over the past 21 years. After the emergence of the players' Union, the balance of labor relations began to shift in MLB. After years of essentially indentured servitude, the newly unified players gradually began to gain concessions from the owners. Two of the most important gains they achieved were the establishment of an independent arbitration process for the hearing of grievances and the requirement that all labor agreements must be negotiated through a collective bargaining process. These two less heralded gains paved the way for significant advances for the players, including free agency. These gains can be seen in a variety of ways, one of which is that the Players' Union has gradually increased the percentage of the pie that the players receive. In 1950, MLB teams paid out an average of 17.6% of their revenue to player salaries. By 2001, player salaries had increased to 54.1% of team revenues. In the early 1980s, the owners grew tired of continually losing ground to the players in collective bargaining, so they came together under the direction of then commissioner Peter Uberroth (pictured) and developed a collaborative plan of action. Simply put, the plan was that no owner would bid on any other owner's free agents. In 1985 and 1986, only four free agents changed teams each year and none of the eight was wanted by his previous team. This tactic of course undercut free agency by eliminating the demand for that player's services, which resulted in lower salaries. This plan constituted collusion, which was a violation of the terms of the Collective Bargaining Agreement (CBA). Eventually, the owners paid the price for the collusion in the form of fines totaling over $280M, but over that four year period, collusion was very effective in holding salaries in place. In 1985, the average MLB salary was $476,142. In 1986, the average MLB salary actually dropped 12.4% to $417,192. In each of 1987 and 1988, there was meager salary growth of 4.2%, which still didn't bring the salaries back up to where they were in 1985. The owners were fined for collusion when the Union won three separate cases for collusion. While the law helped eliminate collusion, it took a massive influx of revenue to get the player salaries back on track. On December 14, 1988, CBS paid approximately $1.8 billion for the rights to broadcast the Saturday game of the week, the All-Star game, the postseason, and the World Series. In addition, on January 5, 1989 ESPN contracted with MLB for the right to show over 175 games beginning in 1990. The ESPN contract was worth $400M to MLB. The overall financial impact of these television contracts is stunning. Looking at the total revenue from national television contracts equalized for inflation by adjusting the values to 2002 dollars, you get a sense of the kind of impact. In 1989, revenue from television contracts was $357,000,000. In 1990, the new contracts saw that number increase all the way to $907,000,000. Given those figures, it's not difficult to see what caused the 74.3% increase in the average player salary in 1991. The new revenue from the television contracts started rolling in during the 1990 season and the owners immediately plowed that money into signing free agents the following offseason to improve their club for the 1991 season. The owners followed up the 74.3% increase in 1991 with a 17.4% increase in 1992. Clearly, the owners are willing to let increased revenue flow down through to the players, which is essentially how it should be. It seems highly likely that the 1994 strike loomed large over player salaries from 1993 through 1995. Owners would not have been willing to hand out large contracts with a work stoppage looming and the lost revenue from 1994 and 1995 resulted in a decrease in salaries in the 1995 season. To this day, it seems strange that the 1994 work stoppage actually happened, as everyone lost out: owners, players, and fans included. Baseball financial information is always difficult to discuss with any degree of precision, as these are private organizations that do not share their financial information. However, Bud Selig is on record saying that overall revenues have risen from ~$1.2 billion in 1995 to $6.075 billion in 2007. A substantial percentage of that increase is being driven by the success of MLBAM, which includes MLB.com and related businesses, and satellite radio. Revenues for MLBAM are growing at 40% a year since it was founded in 2001. In 2001, the owners agreed to share all Internet revenue equally, which means that all owners are reaping the benefits from this new revenue stream equally. For those hoping to see a salary cap in Major League Baseball, I wouldn't count on it any time soon. The game is incredibly healthy from a financial standpoint. Revenue has increased ~6 fold since 2001 and league wide attendance records fall almost on an annual basis. The players and the owners are reaping unprecedented financial rewards, so there is no reason for either side to want to significantly change the terms of the CBA. However, there are also unintended consequences, as this rapid increase in player salaries is also changing the trade market. That kind of increase is incredible and we've already seen what the owners are willing to do with a substantial increase in revenue: pass a big chunk of it on down to the players. So, I don't think it's a stretch to say that salaries may actually increase at a faster rate in the near future. It won't be too long until the question becomes: who will be the first $1 billion ballplayer? In 2007, Jay Bruce took a massive step forward, excelling at three separate levels and earning Baseball America's Minor League Player of the Year Award. At this point, he is the consensus #1 prospect in all of baseball. Not only did Bruce excel, but he made it look easy. The Reds selected Bruce out of West Brook High School in Beaumont, Texas with the 12th overall pick in the 2005 amateur draft. The 2005 draft was an epic draft loaded with talent, including Justin Upton, Alex Gordon, Ryan Zimmerman, Ryan Braun, Troy Tulowitzki, Cameron Maybin, and Jay Bruce. As good as all those guys are, the 20 year old Bruce certainly belongs in that class. Bruce's ascension up the ladder mirrored that of Johnny Cueto. He started out the season in High-A ball, where he hit .325/.379/.586/.965 in 268 At Bats. He hit 11 homers and had a 67/24 K/BB ratio. He had an impressive line drive percentage of 21%. The Reds took mercy on the pitchers in the Florida State League by promoting Bruce to Double-A. At Chattanooga, Bruce continued on his offensive tear posting even better numbers against more advanced competition. He posted a line of .333/.405/.652/1.057 in 66 At Bats. He had a 20/8 K/BB ratio and hit 4 homeruns. In addition, he had a line drive percentage of 17%. Yet again, the Reds took mercy on the opposition, promoting Bruce to Triple-A. At Louisville, Bruce continued his assault on the opposing pitchers, hitting an impressive .305/.358/.567/.925 in 187 At Bats. He had a 48/15 K/BB ratio with 11 homeruns. At Triple-A, Bruce had a line drive percentage of 22%. Bruce rocketed up the ladder and excelling at each and every stop along the way. At this point, he has little left to prove in the minors. He has a tremendous swing that generates a lot of line drives, which are much more likely to fall in for hits than other types of balls in play. Just about the only weakness in Bruce's game is his propensity to strike out. However, he certainly has been tremendously productive, so the type of outs he makes is not a major concern. Ideally, he'll reduce his strikeout rate, but his production is what's important. Bruce has quick hands and a smooth swing that keeps the bat in the strikezone for a long time. His hands are so quick that he has little problem turning on 95 mph fastballs. He is not solely a pull hitter and he can effectively go the other way with pitches on the outer half. Bruce's offensive skills have quickly made him one of the best hitters in the minors. He has good pitch recognition skills for a young hitter. He utilizes a wide batting stance, which gives him a solid foundation. His swing is fairly level and produces a lot of hard line drives, which is also a result of his tremendous bat speed. He has good hand action in his swing and maintains good balance throughout. In addition, the ball really jumps off his bat. He's the type of hitter that you can tell is special just by watching him in batting practice. If you saw his line drive in the futures game, then you know you can also tell that he's special just by the sound of the ball coming off the bat. That hit sounded like a rifle shot coming off the bat. Bruce also has slightly above average speed, which may result in double digit stolen bases. All in all, there is very little on offense that Bruce cannot do. You can access the link to Bruce's MLB draft scouting video here. Bruce is going to be a special offensive player for a long, long time. On defense, Bruce actually prefers to play centerfield, which he can handle adequately, but his range plays better in rightfield. Bruce also possesses above average arm strength and good accuracy. Given the Reds crowded, yet consistently unsettled outfield, Bruce could play any of the three positions, but ultimately his home is likely to be rightfield. Bruce is a legitimate 5-tool talent who has yet to reach his 21st birthday. Bruce should be an MLB superstar for years to come. For the first time in a long time, the Reds have the best prospect in baseball. Bruce will be ready for the majors at some point in 2008, but he may have to wait for a starting job until after the 2008 season and the departure of Ken Griffey Jr.
Bruce's superstar future makes him the easy choice to top the list as the #1 prospect. 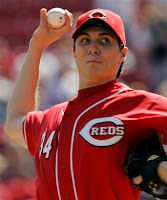 Well, 2007 marked the long awaited arrival of the much hyped Homer Bailey. The Reds have suffered for years from an inability to develop homegrown pitching. In fact, it's the defining characteristic of the organization over the past decade or so. It's difficult to quantify just how harmful this ineptitude has been, but the trickle down effect has been enormous. It started with Marge Schott's decision to gut the scouting department in an effort to save money, which in reality was not saving at all. Rather, it just shifted the cost onto the backs of future Reds' teams, as the flow of young, inexpensive talent dried up and the Reds were unable to find viable replacement talent. However, after years of ineptitude, there is light at the end of the tunnel in the form of Homer Bailey and Johnny Cueto. Given the dry spell, the expectations for Homer were enormous among the Reds fans. It would have been damn near impossible for him to have met them, so his debut was widely panned among fans who expected more out of him. But, was the disappointment valid? At the MLB level, Homer had his ups and downs. He worked in only 45.1 innings posting a 5.76 ERA with a 1.57 WHIP. In addition, he had a 5.56 BB/9 and a 5.56 K/9 with a 1.32 GB/FB ratio. Bailey struggled with his consistency, but did show flashes of his true abilities in games against Oakland and Arizona. Clearly, Homer struggled with his command, but did throw a first pitch strike 55% (Harang - 66%) of the time and limited the opposition to a contact rate of 78% (Harang - 78%). Homer also went to a 3-0 count in 6% (Harang - 3%) of the total plate appearances. Overall, Homer needs to refine his command in order to capitalize on his plus stuff. Homer features a fastball that sits in the 92-96 range, but has late life that makes it seem even faster. Bailey also features two curveballs, one a 12-6 hammer and the other a slower, loopier curveball with an 11-5 break. The curveball is a plus pitch that is a knee buckler to righties and a backdoor pitch to lefties. Finally, Homer throws a changeup that is his third pitch. While it is clearly his third offering, it has some deception to it and features a bit of late sink. Homer has a free and easy delivery, which should enable him to stay healthy. His has a live, loose arm that generates easy velocity, but the Reds would be wise not to overwork him in the Dusty Baker era. While some Reds fans were disappointed in Bailey, there is still a lot to like. He got his feet wet in 2007 and should be ready to build on that in 2008. To improve, he must have better command in general, but especially with his offspeed pitches. It's unclear where Homer will start off in 2008, but he is likely to be in the Reds starting rotation. While Homer had a some rocky moments in 2007, he should take a big step forward in 2008 and he gets the #2 slot on the list. It's hard to describe just how good Johnny Cueto was in 2007. He dominated at three separate levels of the minor leagues. In fact, he only seemed to get better as he climbed the ladder. His performance almost warrants the #2 slot on the prospect list, but he didn't quite pass Homer Bailey. Cueto, who was signed as an international free agent, joins Juan Francisco in proving the importance of international scouting in the modern era. To be competitive, smaller market teams must have top notch farm systems to provide a flow of inexpensive young talent. In order to have a top flight farm system, the organizations must bolster the prospects acquired in the draft with international free agents. Cueto and Francisco are two of the top ten prospects in the Reds system and each was an international free agent. In 2007, Cueto started at High-A Sarasota, where he posted an impressive 3.33 ERA with 1.19 WHIP and a 72/21 K/BB ratio in 78.3 innings. In addition, his groundball percentage was 47%. His performance earned him a promotion to Double-A. At Chattanooga, Cueto posted a 2.05 ERA with a 1.09 WHIP and a 21/2 K/BB ratio in 22.0 innings. In addition, his groundball percentage was 36%. But, Cueto wasn't finished, as he also excelled at Triple-A. At Louisville, Cueto posted a 3.10 ERA with a 1.03 WHIP and a 77/11 K/BB ratio. His groundball percentage was 34%. All in all, it was truly an extraordinary performance from Johnny Cueto. Cueto is small in stature, standing only 5'10" tall and tipping the scale at 192, but he has a big arm. He throws a 92-94 mph fastball that occasionally touches 96. He works with a free and easy high three-quarters delivery and can locate the fastball to each side of the plate. Cueto also picked up a changeup from the instruction of former Red great Mario Soto that quickly became an MLB league average pitch. In addition, Cueto also throws a slider that can overmatch hitters at times. Cueto's size raises durability concerns, but for now he seems to have a rubber arm. His arms are long, which gives him good leverage and may prevent him from wearing down. As if to answer questions about his durability, Cueto also pitched in Dominican Winter League, where he pitched 22.0 innings and posted a 3.10 ERA with a 1.18 WHIP. He continued his impressive display of power and command, posting a 22/6 K/BB ratio. Cueto's 2007 performance has earned him a long look at a spot in the starting rotation in Spring Training. If he doesn't make the squad out of spring training, then he'll return to Triple-A Louisville to continue to refine his pitches. At this point, he doesn't seem to have much left to prove or work on, so he should be up in the Majors in the very near future. Cueto's extraordinary season earns him the #3 spot on the list. The Reds have never been shy about scouting north of the border, drafting the likes of Philippe Valiquette, Joey Votto, and Kyle Lotzkar to name a few, but Votto is clearly the class of group. 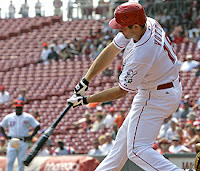 The Reds selected Votto in the 2nd round with the 44th overall pick in the 2002 draft. After a down year in 2005 in which he hit only .256/.330/.425/.755, Votto bounced back in 2006 to establish himself as the premiere first base prospect in the minors. It's odd that Votto is the top first base prospect in the minors, considering that he was originally drafted as a catcher. Taking that into account, it's not surprising that Votto is still raw at first base, where his hands are below average, he occasionally finds himself out of position, and his footwork still needs work. However, since Votto is a hard-worker who is always looking to improve his game, these defensive deficiencies will likely be improved upon. Votto has even become a threat on the base paths through his dedication and hard work. At the plate, Votto has a quiet setup. He utilizes the whole field well, he's equally adept at going to the opposite field or turning on an inside pitch. Unlike many lefthanded hitters, Votto doesn't let go of the bat with one hand on his follow through. In fact, he's got a fairly compact swing for a power hitter, but since he still gets good loft on the ball it doesn't limit his power. Votto also stays on the ball very well, so he can drive the ball with authority to the left-center field gap. In 2007, Votto had a line drive percentage of 34%, which helps account for his .321 batting average. Of course, Votto is not going to be able to hit that many line drives next year, but Votto does have the requisite skills to post a high average. In addition to his solid hitting skills, Votto possesses some of the best on base skills in the Reds system. Oddly enough, Votto bears many similarities to the man he will be replacing in 2008, Scott Hatteberg. Both have strong on base skills and take a professional approach, but Votto has more power. However, a better comparison for Votto may be Lyle Overbay, a professional hitter who provides solid production, but doesn't have elite power traditionally found at the position. Overall, Votto should be a very productive Major League hitter for years to come. However, given how high the benchmark has been set at first base, he's probably not an All Star. Even so, based on his likely production and low cost, he should be a very valuable asset for the Reds for years to come. Votto's professional approach at the plate earns him the #4 spot on the list. Two things had to happen for me to appreciate Drew Stubbs. First, I had to get over the fact that he wasn't Tim Lincecum. Second, he had to choke up on the bat. Stubbs was part of the new draft philosophy implemented by scouting director Chris Buckley that emphasizes premium talent at up the middle positions. Stubbs is 6'5", 190 lbs, bats right, and throws right. 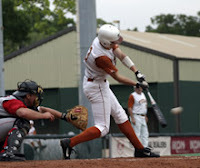 He went to the University of Texas, where in 2004 he posted an .846 OPS, a .911 OPS in 2005, and a 1.019 OPS in 2006. He was the Big 12 Conference Player of the Year in 2006. 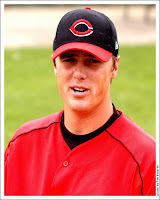 The Reds selected Stubbs with the 8th overall pick in the 2006 draft and the Reds signed him for $2M. Stubbs made his debut for the Reds in 2006 at Rookie Level Billings. He posted a respectable line of .252/.368/.400/.768, however his 64 strikeouts in only 210 At Bats was of concern. He also clubbed 6 homers and stole 19 bases in 23 attempts. Stubbs has had problems with strikeouts throughout his career, so his first season in the Rookie league confirmed a lot of fears. In 2007, Stubbs started out at low-A Dayton. In Dayton, Stubbs started out the season poorly. He caught fire when the manager, frustrated by team wide offensive performance, forced the entire team to choke up on the bat. After that happened, Stubbs started to pound the ball. He hit .293/.425/.500 in July and .321/.372/.532 in August. Stubbs is not a player who forces an early consequence to his plate appearances. Accordingly, he will get his fair share of walks and strikeouts, which only happen in deeper counts. However, Stubbs needs to work on reducing his strikeout rate a bit to ensure that he maximizes his offensive potential. That said, his approach does lead to fairly strong on base percentages, so while his contact rate needs improvement, he shouldn't sacrifice his patience at the plate. A high on base percentage is one of the most important things a ball player can have. It's difficult to believe that a change as simple as choking up on the bat could result in a such a big turn around in performance, but it may well be legitimate. By choking up, Stubbs improved his bat control and may ultimately have unlocked his potential. Stubbs is a tremendous athlete. He has great speed and massive power. He gets down the line from the right side of the batters box in 4.1 seconds. At the plate, Stubbs utilizes a nice, quiet approach. He doesn't have excess movement in his batting stance. He takes a slightly wider than shoulder-width stance and a normal length stride. Stubbs has a smooth, fluid swing without any hitches. He maintains good balance and tempo throughout his swing. Most right-handed swings don't look visually appealing to the eye, but Stubbs has one that measures up. However, his swing does get long, which is where his strikeout problems come into play. In addition, the longer swing can make him susceptible to offspeed pitches. It'll be interesting to see if choking up on the bat shortens up his swing and gives him greater bat control, both of which would increase his contact rate and decrease his strikeouts. Stubbs is also very fast and possesses good first step quickness. He has a long stride that chews up a lot of ground. His speed translates well both on the bases and in the field. You can access Stubbs' MLB draft scouting video here and you can access a video interview with Drew Stubbs here. Stubbs has all the tools to be a tremendous offensive talent. However, tools don't always translate into performance. Even so, Stubbs may have figured out something very important last season. Stubbs is one of the best defensive players in the Reds' farm system. He's already considered to be a gold glove caliber center fielder. He has great range, gets a great read on the ball, and has a solid arm. His arm isn't great, but it plays average. Overall, Stubbs is a premier defensive talent at a premier defensive position, something that has been sorely lacking in Cincinnati as of late. At the big league level, the Reds have been plagued by poor defense. In fact, defense, even more than pitching, has largely been responsible for the Reds continuing struggles. Stubbs is the first attempt by scouting director Chris Buckley to rectify this problem. Stubbs addition to the farm system immediately improves the Reds centerfield depth and provides a potential impact glove for the Reds in the future. When you watch Stubbs play, it's not difficult to see what the Reds liked about him. He looks like a natural. He moves well, throws well, runs well, and has light tower power. If he can improve his contact rate, he'll be an impact offensive player. Given his defensive talent, he won't have to hit much to be an everyday starter at the big league level. However, he does have substantial upside which could one day make him an All-Star. While he has drawn comparisons to Dale Murphy, Stubbs more likely projects to be Mike Cameron. Regardless, if Stubbs actually turns out to be either the former or the latter, the Reds will be more than satisfied. He'll only be 23 in 2008, so he has time to develop, but if his new approach at the plate is legitimate, then he could move quickly. Stubbs resurgence on offense coupled with his impact glove lands him at #5 on the list. Todd Frazier is a baseball player. That sentence may not seem like it says much, but in reality it says it all. The description seems to fit him better than most. In fact, it seems to describe him through and through. Frazier started his baseball career out strong, by leading his Toms River New Jersey team to the Little League World Series title in 1998. Baseball is in his blood. He even has two brothers who have played professionally. Frazier continued his career at the University of Rutgers, where he posted a .897 OPS in 2005, a 1.070 OPS in 2006, and a 1.259 in 2007. 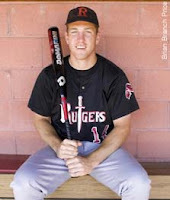 The Reds drafted Frazier out of the University of Rutgers with the 34th overall pick in the 2007 draft. The Reds received the 34th overall pick as compensation for losing free agent Rich Aurilia, which again just illustrates the importance of embracing a degree of player turnover. On top of his overall impressive skill set, Frazier has a tremendous understanding of the game. Some players have the athletic ability, but not the baseball IQ. Others have the baseball IQ, but not the skill set. Frazier is one of the few prospects who possesses both. He'll be 22 years old to start the 2008 seasons. He's 6'3", 215 lbs, bats right, and throws right. Frazier didn't waste any time making his mark in the professional ranks. The Reds sent him to Billings of the Pioneer league, where he posted a most impressive .319/.409/.513/.922 in 160 At Bats. To top it off, Frazier posted an impressive 22/18 K/BB ratio and had 5 home runs. His performance earned him a promotion to low-A Dayton, where he continued his offensive tear against the more advanced competition. At Dayton, Frazier hit .318/.375/.727/1.102 in 22 At Bats with 2 home runs in 22 At Bats. In addition, he had a 4/2 K/BB ratio. All in all, it's hard to imagine a more impressive start to a career. Frazier not only displayed tremendous hitting ability, but also very strong plate discipline. He clearly has a well rounded offensive skill set, including the plate discipline that so few young prospects possess. Frazier has plus power with a line-drive swing. He uses a fairly wide stance with a small stride. He has good bat speed, despite a slightly unorthodox technique that robs his swing of any aesthetic beauty. Frazier uses a slight hand twitch as a trigger mechanism to start his swing. It may cause problems in the future, but for now it isn't impacting his performance. A better fastball found at the more advanced levels may be able to find a hole in the swing caused by the trigger, but so far so good. Frazier has a polished approach and demonstrates good control of the strikezone, which enables him to post strong on-base numbers. When he does get on base, Frazier acquits himself well. He lacks top notch speed, but he's a smart baserunner and a good percentage player. 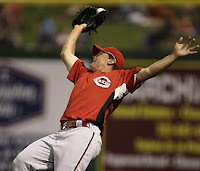 Frazier isn't the most graceful ballplayer, but his approach works well for him, and production always trumps style. It'll be interesting to see how he performs at the upper levels, as polished college players should have good success at the rookie level and A ball. However, the real test for Frazier will come against Double-A pitching. You can access an ESPN video about Frazier here. Frazier has a fundamentally sound game. He gets in good fielding position, but his footwork is suspect. He lacks first step quickness, so his range is below average at short. He's a big guy who just doesn't move all that well at shortstop. His arm strength is above average and he has good accuracy. However, his skills and defensive abilities profile well at the hot corner. The Reds are likely to move him to third sooner rather than later. Frazier has all the tools to be an impact player in the Major Leagues, but its more than his baseball skills that make him a blue chip prospect, its the intangibles. Scouts rave about Frazier's baseball IQ and instincts. Frazier's style is a bit unorthodox, but its been working very well for him. It'll be interesting to see if more advanced competition can expose any weaknesses in Frazier's game. Until that time, he'll continue to roll, all the way up the organizational ladder. For now, Frazier sits at #6 on the list. Juan Francisco and Johnny Cueto illustrate the importance of having a strong Latin America scouting program. Each is a product of the revived Latin America scouting effort. Each was a product of the Reds baseball academy. In this day and age, it's vital for smaller market teams to have strong farm systems. In order to have a strong farm system, it's vital to supplement the prospects selected in the draft with international prospects signed as free agents. Two of the Reds' top ten prospects were signed as international free agents, which is a very good sign for the future. Francisco was signed out of the Dominican Republic. He's 6'2", 180 lbs, switch hits, and throws right. He'll be 20 to start the 2008 season, but already possesses some of the best power in the system. 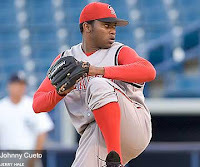 Francisco made his professional debut in 2006 with the Gulf Coast League Reds. He played 45 games and hit .280/.305/.407/.712 in 182 At Bats. He hit 3 home runs and stole 2 bases, but posted an ugly 35/6 K/BB ratio. He was then promoted to Billings of the Pioneer league, where he hit .333/.333/.417/.750 in 36 At Bats and a 8/0 K/BB ratio. In 2007, the Reds sent Francisco to low-A Dayton, where he posted a line of .266/.299/.461/.760. He hit 25 homeruns and stole 12 bases in 18 attempts. Francisco again posted an ugly 161/23 K/BB ratio. He had a 4.9 BB% and a 28.4 K%. It's very impressive to see a young prospect hit with so much power, especially considering that power is often the last tool to develop. In addition, Francisco showed better than expected speed, but needs to improve his success rate on the bases. Clearly, Francisco needs to improve his walk rate and cut down on his strikeouts, but given his age and performance to date there's reason to believe he can do both. Francisco hit .275/.297/.463/.759 against left-handed pitchers and .263/.301/.463/.764 against right-handed pitchers. He posts very similar numbers from both sides of the plate. In addition, Francisco had the best day of his professional career, cranking 3 homers in a single game against the Lansing Lugnuts. Francisco has the raw power to match anyone in the system. In addition, he has an advanced approach at the plate for such a young player and also has good pitch recognition skills. Francisco has strong hand action and has shown the ability to drive the ball to the opposite field. He's a switch hitter who doesn't appear to have a weaker side, as his performance from both sides of the plate is impressive. Given that he is only 20 years old, his performance is most impressive and his upside is considerable. His impressive raw athletic ability and his offensive skillset project him to be an impact offensive player in the future. Obviously, his strikeout rate and walk rate are red flags, but Francisco has time to improve in these areas. His ability to improve in these areas may ultimately determine his career path, but his age and upside are strongly in his favor. Francisco has one of the strongest infield arms in the system. Not only is his arm strong, but it's also accurate. Francisco is very athletic and could develop into an above average defensive third baseman. However, Francisco is still raw in the field and some predict that he'll end up in the outfield, where his athleticism and arm still profile well. In 2007, Francisco had a .923 fielding percentage, which he'll need to improve. In addition, Francisco had 23 Errors against 19 Double Plays, which is a quick and dirty technique suggested by Bill James to analyze a third baseman's defensive performance. Ideally, you want to see more Double Plays than Errors out of your third baseman. Francisco will need to reduce his errors and polish his defensive game, but he's young and the Reds will be in no hurry to shift him off the hot corner. He's got all the skills needed to be a quality third baseman. Francisco has tremendous athletic ability. He lacks polish, but he has all the raw skills needed to take it to another level. His power is already tremendous and is only going to improve as he fills out. His age, athleticism, and frame allow for a great deal of projection. If he can improve his walk rate and cut down on his strikeouts, then the sky is truly the limit Francisco. His athleticism is tremendous and development time is definitely on his side, so it'll be very interesting to see what he can do in 2008. A big step forward isn't out of the question. For now, the switch hitting Juan Francisco lands at #7 on the list. An interesting thing happened to Adam Rosales in 2007. He went to bed one night as a shortstop and woke up the next morning as a first baseman. I'm not sure exactly when it happened or why, but it is a curious move and has a huge impact on his status as a prospect. A move from shortstop to first base is a huge slide down the defensive spectrum. The positions at the left end of the spectrum are more difficult than those at the right end. Accordingly, offensive production is more valuable from positions on the left end of the spectrum, as there are fewer players who can produce at the more difficult positions. Throughout the course of a player's career, he can typically slide to the right on the defensive spectrum, but rarely do players successfully move to the left on the spectrum. Put into perspective, moving Rosales from shortstop to first base is about as far as you can fall on the defensive spectrum. Rosales played for four years at Western Michigan University, following in the footsteps of such luminaries as Ribs Raney, John Vander Wal, and many others. While there, he compiled an impressive list of statistics for a shortstop, which did not go unnoticed by Reds area scout Rick Sellers, who felt that Rosales was undervalued. The Reds subsequently selected Rosales in the 12th round of the 2005 draft with the 362nd overall pick. Rosales debuted in 2005, making a very quick impression in stops at Billings and Dayton. Between the two stops, Rosales hit a combined .325/.388/.558/.946, which quickly put him on the radar as a prospect to watch. For his career, Rosales is hitting .285/.368/.492/.860. In 2007, he successfully made what's considered the most difficult jump in professional baseball when he hit a rock solid .278/.377/.549/.926 at Double-A Chattanooga. In 2007, Rosales saw his Isolated Power jump from .197 at High-A to .271 at Double-A. In addition, his Line Drive % jumped from 13% at High-A to 17% at Double-A. That level of performance certainly helped to solidified his prospect status after the position switch. Rosales has demonstrated strong on base skills throughout the course of his baseball career, but the question is now whether he'll have the power necessary to be an MLB first baseman. His production would have been great at shortstop, but the baseline production at first base is much higher and there's no guarantee that Rosales will be able to reach it. Clearly, Rosales lacked the skills necessary to stick at shortstop at the professional level. However, it's difficult to understand why the Reds didn't give him an extended look at second or third. All the scouting reports indicate that he has a strong arm, good hands, and decent range. It's difficult to imagine a shortstop at the college level and early in his professional career being unable to play a more challenging position than first base. Given those defensive skills, he seems able to handle a more challenging defensive position. The more challenging the defensive position, the more valuable the offensive production. Offensive production that is All Star caliber at shortstop may be below average at first. The move to first base just made Rosales' job on offense that much tougher, as he'll have to improve his power output in order to make it to the majors. Rosales is currently playing for the Surprise Rafters in the Arizona Fall League where he's been playing first base and batting .289/.360/.467/.827. While those would be solid numbers for a middle infielder, they aren't likely to cut it at first base. Rosales responded well on offensive to the move to first, posting a solid line of .286/.385/.519/.904 in 2007 at high-A Sarasota and Double A Chattanooga. While that level of production is encouraging, he'll have to continue to develop his power if he's going to remain a top prospect. Ultimately, the switch to first base may end up robbing Rosales of a substantial portion of his value as a prospect, but he still may be able to take his offense up a notch, so for now he checks in at #15. The Reds acquired Matt Maloney from the Phillies last year for Kyle Lohse. Since Maloney arrived in the Cincinnati organization, he's opened up a lot of eyes and given pause to those fans who felt that Wayne Krivsky shouldn't have traded Zach Ward for Kyle Lohse. At this point, Maloney seems to be a better prospect than Ward. It's interesting to see the Reds acquiring a lot of guys with high baseball IQs over the last couple of years, including Matt Maloney, Devin Mesoraco, Danny Dorn, and Todd Frazier. It's nice to have guys in the in organization who play smart baseball and always seem to make the right percentage play. 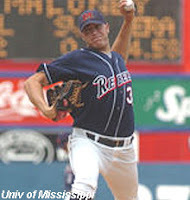 Maloney went to the University of Mississippi. He's 6'4, 220 lbs, bats left, and throws left. He'll be 24 years old heading into the 2008 season. Maloney features four solid pitches, including a fastball, changeup, curveball, and slider. None of the four pitches is a plus pitches, but his tremendous command and feel make the pitches play up. His fastball is his best pitch and it sits in the 86-89 range with tremendous late sink. His changeup is his second best offering and he is not afraid to throw it at any time. His curveball has an 11-5 break on it and is a big looping type breaking ball. His lack of velocity limits his upside, but Maloney understands how to get the most out of what he has, which is always a good thing in a pitcher. Most scouting reports have him pegged as a backend of the rotation starter due to his lack of a plus pitch. However, given his stellar performance at each and every level over the past couple of years, it may be time to increase his ceiling to that of a #3 starter. Maloney has had nothing but success at every level. From 2005 through 2007, Maloney put up quality numbers at every stop. He posted a 3.89 ERA with a 1.43 WHIP and a 36/15 K/BB ratio in 37 innings at low-A ball. At high-A, Maloney posted a 2.02 ERA with a 1.14 WHIP and a 180/73 K/BB ratio in 169 innings. At Double-A, Maloney continued to roll posting a 3.69 ERA with a 1.18 WHIP with a 154/48 K/BB ratio in 153.2 innings. And, finally, at Triple-A, Maloney posted a 3.18 ERA with a 0.94 WHIP and a 23/6 K/BB ratio in 17 innings. In his minor league career, Maloney has a 3.4 BB/9 and a 9.4 K/9. In addition, he gets a heavy amount of groundball outs due to his good sinker, which will play well in Great American Ball Park. On average, Maloney has GB% of up over 40% for his minor league career. While his stuff is not considered to be above average, the results certainly are. Mechanically, Maloney is sound. He works from a three-quarters arm slot, rather than a pure over the top slot. He has a clean, efficient delivery that doesn't have any unnecessary movement. He doesn't have a lot of effort in his delivery, which isn't unexpected considering his lower velocity, but it still should reduce his chances of injury. His arm action is clean and efficient, which makes his delivery much easier to repeat. Unlike Travis Wood, Maloney's leg kick doesn't wrap around his body, but rather it stays pretty much in line with his "glove-side" (GS) shoulder. Wood coils his body up, which enables him to store more energy and impart more velocity on the ball. Maloney's straighter leg kick doesn't create as much power as Wood's coiled approach. One thing that's a bit unorthodox with Maloney is that he throws across his body (which you can see in these photos, note the closed position of the Glove Side leg and the cross-fire action of the arm). His "glove-side" (GS) leg lands outside of his original foot position on the rubber. In essence, when he plants his GS leg it lands closer to first base than his feet were to begin with. This leaves his body closed off from home plate, so he has to throw across his body in order to deliver the ball to home plate. This also results in Maloney falling off the mound towards the third base side, as his momentum is going that way from having to throw across his body. Accordingly, he isn't in the best of fielding positions at the end of his delivery. You can access the link to Maloney's MLB draft scouting video here. All in all, Maloney's mechanics are fundamentally sound, which should result in consistent results and a decreased risk of injury. Maloney is an interesting prospect. The scouts will tell you that his stuff isn't good enough to be a quality starting pitcher, but he keeps having substantial success as he climbs the ladder. His great strikeout rate defies his reputation for average stuff. It'll be interesting to see if pitching savvy and guile can overcome less than elite stuff. To date, his performance at every level necessitates a bump in his potential ceiling to that of a #3 starter, but whether his stuff will play at the MLB level remains to be seen. Of course, that's the same question that's been raised at each stop of his career, but at some point the argument that is stuff won't play at higher levels must yield to the fact that his stuff IS playing well at the higher levels. For now, the crafty lefty Matt Maloney comes in at #13. Travis Wood is the best left-handed pitching prospect the Reds have had in quite some time. The Reds grabbed Wood in the second round of the 2005 draft with the 60th overall pick. Wood was drafted out of Bryant High School in Arkansas. He's 5'11 tall, 166 lbs, bats right, and throws left. Wood features a fastball that regularly sat at 93-94 in high school, but was down in the 87-91 range in 2006 and 2007. The fastball has good movement, but the Reds would love to see his velocity bounce back. Wood also features one of the best changeups in all of the minor leagues. Wood uses the circle change grip and the pitch is nearly indistinguishable from his fastball coming out of his hand. In addition, his changeup has good late sink as it reaches the plate. Wood is still trying to refine his curveball, which he'll need in order to have success against the more advanced competition. Wood exploded onto the scene in 2005, dominating the Rookie League with both the Gulf Coast League Reds and the Billings Mustangs. In the Gulf Coast League, Wood posted a 0.75 ERA with a 0.83 and a 45/7 K/BB ratio. He then was bumped up to Billings, where he had a 1.82 ERA with a 1.14 WHIP and a 22/13 K/BB ratio. In 2006 at low-A Dayton, Wood built on his rookie season success. He pitched 140 innings posting a 3.86 ERA with a 1.17 WHIP and a 133/56 K/BB ratio. 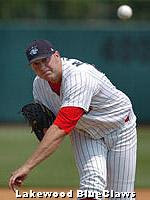 In 2007, Wood was promoted to high-A Sarasota, where he worked only 46.1 innings. Wood struggled with tendinitis in his pitching arm. It's not an injury that is of long-term concern, but it did cost him some development time. Wood tried to pitch throw the tendinitis, which impacted his overall numbers. As a result, he only had a 4.86 ERA and a 1.64 WHIP, but he still had a stellar strikeout rate. He struck out 54 batters in only 46.1 innings pitched, but also walked 27 batters. Wood has consistently posted dominating numbers. Last year was he least impressive, but was also injury plagued. Now that he's healthy, Wood is very likely to bounce back in 2008, but he needs to continue refining his other pitches as he climbs the ladder. The more advanced competition at the higher levels will force Wood to rely on a more diversified repertoire, but he'll only be 21 next season so he's still got plenty of time to develop. Simply put, Wood has very solid mechanics. There just isn't much not to like. Wood starts his motion off by stepping to the side with his "glove side" (GS) leg, then bringing it up into a high leg kick. His leg kick coils his hips, which provides a lot of storied energy to be unleashed when he uncoils. He has a strong "drop and drive" move towards the plate, which gives him a good push off the rubber. He doesn't throw from straight over the top, but rather from a very high three-quarter arm slot. He has good balance and consistent tempo throughout the motion. His tempo is quick, but he keeps his body in sync. The only real issue he might have is a rather minor one. Occasionally, he seems to pitch against a stiff GS leg. Instead of landing on the GS leg and finishing with his upper body over the top of his legs, he occasionally throws against a firm GS leg, which results in his upper body being pushed back towards the mound against his GS leg and his upper body not finishing over the top of his legs. This is a minor issue, but it's possible that throwing against a stiff GS leg could increase the strain on the arm. You can access Wood's MLB draft scouting video here. All in all, Wood's mechanics are sound. I wouldn't put them in a class with Josh Ravin, but they are very solid. However, there is quite a bit of effort in Wood's delivery. His motion is quick and he puts a great deal of effort into each pitch, which could increase the stress on the arm. Factor in his slight build and there is an increased cause for concern on the injury front, so the Reds will have to handle him carefully. Wood's future is bright, but he is living on his changeup against inexperienced competition. In addition, his max effort delivery and injury in 2007 are cause for concern. To be successful, Wood will have to stay healthy and improve his other offerings. Ultimately, Wood has #3 starter upside, but he's got quite a way to go before he can reach it. He'll likely head back to high-A Sarasota to start 2008. Ultimately, his success at the higher levels will be determined by his health and the quality of his secondary pitches, but for now Travis Wood clocks in at #9. The Reds continued to adhere to the new draft philosophy implemented by scouting director Chris Buckley when they selected Devin Mesoraco with the 15th overall pick of the 2007 draft. Under Buckley, the Reds have focused on acquiring strong, up the middle talent in the draft. It started in 2006 with centerfielder Drew Stubbs and shortstop Chris Valaika and continued in 2007 with catcher Devin Mesoraco and shortstops Todd Frazier and Zach Cozart. 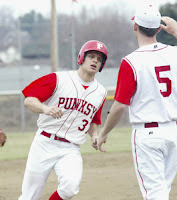 Mesoraco was drafted out of Punxsutawney High School in Pennsylvania. He's 6'1, 200 lbs, bats right, and throws right. Mesoraco was a 19 year old senior when the Reds drafted him, so he is a bit older than expected. Accordingly, he'll already be 20 in June of next season. There really isn't a euphemistic way to say it: Mesoraco's professional debut went over like a lead balloon. Once under contract with the Reds, Mesoraco was sent to the Gulf Coast League Reds where he hit .219/.310/.270/.580 in 140 ABs. On the plus side, Mesoraco walked in 9.6% of his plate appearances. On the downside, he hit line drives only 8% of the time. While there certainly isn't much to get excited about here, there also isn't much cause for concern either. Mesoraco was 19 years old and getting his first taste of professional ball. In addition, he was playing through lingering injuries to both thumbs, which also hindered his performance. The sample size is too small and there are just too many variables to draw any conclusions from his 2007 stats at this point. Mesoraco has a nice collection of offensive skills. He makes good contact, possesses good power, and has good pitch recognition. In addition, he runs well...for a catcher. At the plate, Mesoraco uses a wide stance, which limits the length of the stride. In fact, he essentially just lifts his front foot and puts it back down in the same spot. Given that he lacks a stride, Mesoraco relies on weight transfer to get his body moving towards the pitch. Prior to the pitcher's windup, he rocks back and forth slightly from his front foot to his back foot. When the pitcher starts his windup, Mesoraco flexes his left knee to shift his weight onto his front front. When the pitcher gets ready to release the ball, Mesoraco straightens his left knee to transfer his weight to his back foot to load up for the pitch. He seems to use this rocking type motion in his pre-pitch routine to improve his weight transfer during the swing and offset the impact of his no-stride approach. The lack of a stride at the plate may have made it difficult for him to consistently get his weight moving forward to attack the pitch. The rocking motion that he uses offsets this, as it enables him to effectively get his weight moving forward towards the pitch. However, the one problem that Mesoraco seems to have may be related to this technique. Mesoraco can occasionally get out on his front foot a bit too much in his swing. This is likely a byproduct of his no-stride approach, as his weight transfers forward in the swing, but his front foot does not move forward, so he can get too far over his front foot in the swing. You can access the link to Mesoraco's MLB draft video here. Overall, Mesoraco is a very good athlete and has a very nice offensive skillset. Ultimately, he could develop into the rarest of the rare: the offensive catcher. Mesoraco has all the tools to be a very strong defensive catcher. Despite undergoing Tommy John surgery in 2006, Mesoraco has plus arm strength and very good accuracy. His arm action is short and compact, which is what you like to see in a catcher. 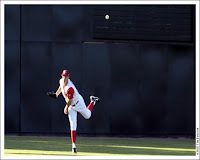 In addition, he's got good footwork, which enables him to get into a good position to throw. Mesoraco is a good receiver, as he has soft hands and is accomplished at blocking balls in the dirt. He also has strong leadership skills and a baseball IQ that is off the charts. In short, defensively Mesoraco is exactly what you look for in a catcher. At this point, there's no need to worry about his slow start in 2007. He got his feet wet and knows what to expect from professional baseball. He can use this off season to get healthy and take what he learned last year to better prepare for the 2008 season. All in all, I expect a big step forward from Mesoraco in 2008 and he could move well up the list with a strong performance. At this point, he hasn't shown much and high schools catchers are second only to high school pitchers in terms of the risk of flaming out, so he still needs a lot of development time. The best case scenario for Mesoraco is that he develops into the Cincy version of Dodger catcher Russell Martin. For now, his impressive overall skillset and his intangibles land him at #8 on the list. Chris Valaika was one of the best stories out of the 2006 Reds draft class, as he had a spectacular professional debut. He's 6'1 tall, 180 lbs, throws right, and bats right. The Reds drafted Valaika with the 84th overall pick in the 3rd round of the 2006 draft. Valaika may have been a steal at that point, his value was likely driven down due to a knee injury that he suffered as a sophomore in college. Valaika was a 1st team Freshman All American at UC Santa Barbara after posting a line of .347/.411/.536/.947. The knee injury limited him to 18 games as a sophomore and a line of .208/.253/.278/.531, which dropped his draft stock a bit. However, Valaika bounced back as a junior, hitting an impressive .335/.372/.529/.901. In addition, Valaika has a lot of experience playing for Team USA, as he's represented the United States on national youth, junior, and college teams. All in all, Valaika is a very polished prospect. That was enough to convince the Reds. Valaika exploded onto the scene when he set a Pioneer League record with a 32-game hitting streak and winning the MVP. 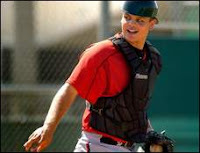 In 2006 at Billings, Valaika hit .324/.387/.520/.907 with a 24/61 BB/K ratio. He managed to hit 8 homers and 22 homers, which points to a bit more power potential in the future. While his performance was impressive, it is tempered by the fact that he was a college player in the rookie league, so he should perform well. In addition, his 2007 season was a bit of a disappointment. Valaika started out 2007 at low-A Dayton, where he hit a solid .307/.353/.493/.846 with 10 homers in 300 ABs. He was then bumped up to high-A Sarasota, where he struggled against more advanced competition. He posted a line of .253/.310/.332/.642 in 217 ABs. Despite his decline in production after his promotion, Valaika actually improved his BB% improved from Dayton (5.1%) to Sarasota (5.4%) and reduced his strikeout rate from Dayton (21.8%) to Sarasota (17.4%). While that was a positive sign, his BABIP regressed from .376 at Dayton to .306 at Sarasota and his line drive % also decreased from 18% at Dayton to only 12% at Sarasota. So, his hit luck regressed to the mean and his line drive rate dropped as well. Valaika may have tired down the stretch or just struggled against more advanced competition, but whatever the reason, he'll have to get back on track and square the bat on the ball to get his line drive percentage back up. The higher the percentage of line drives, the higher the percentage of balls in play that will fall in for hits. While it's understandable that Valaika struggled as he moved up the ladder, as an experienced college player you'd like to see him have decent success until he reaches Double-A, where the competition is much more polished and challenging for college players. In addition, Valaika's career K/BB ratio is cause for concern, as in three professional seasons he has a 175/54 ratio. Improving his on base skills and his strikeout rate would improve his chances for success at the higher levels. Valaika may already be on the road back, as after a slow start in the Hawaii Winter Baseball League for the North Shore Honu, Valaika is hitting .306 in his last 10 games. That hot streak brings him up to .269/.319/.398/.717 overall. Hopefully, this a sign of things to come in 2008. Valaika has a short, compact swing and quick hands that makes him fairly quick to the ball, but he has a few moving pieces in his swing that may leave him susceptible to a good fastball or quality off-speed pitches. Valaika has a fairly quiet setup, but he begins with his hands in front of his right shoulder, moving them back to the hitting position during the pitcher's windup. In addition, Valaika utilizes a fairly high leg kick as a timing mechanism in his swing. The hand position in his setup may cause him to be late on good fastballs. As long as he gets his hands back into the hitting position in time, it won't be an issue, but a good fastball reaches the plate faster and leaves less time for Valaika to get his hands into position. It likely won't be a problem, but it bears watching. As for the higher leg kick, that may result in Valaika being out in front of good off-speed pitches. A high leg kick is a timing mechanism for the swing, but if the hitter is fooled by an off-pitch, then his timing will be off because his leg kick started too soon. However, Valaika does have good pitch recognition, which will help him avoid problems with the higher leg kick. Overall, Valaika has solid offensive skills that should translate fairly well at the upper levels. You can access the link to Valaika's MLB draft scouting video here. Valaika's speed is below average, which hinders his range and may ultimately force him to the other side of the second base. However, he's got good footwork which enables him to get into good fielding position and he has good hands to vacuum up groundballs. Valaika also has a strong, accurate arm that should play well just about anywhere. Ultimately, his range, which couldn't have been helped by his knee injury, may relegate him to second base, but he could be a solid, offensive second baseman. Despite his late season fade, Valaika is still an intriguing prospect. As of now, it's impossible to tell if his late season struggles were nothing more than a bump in the road or rather indicative of problems to come. Next year will provide another data point and reveal a lot about Valaika's future. In 2008, he could rebound, putting him back on track as a potential starter at the MLB level or just continue his slide into a potential future as utility man. For now, his polished skill set and good hitting skills land him at #10 on the list. 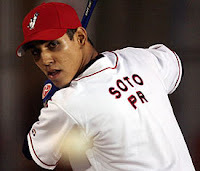 When Neftali Soto first caught my eye with his performance in the Gulf Coast League, I thought Soto was yet another example of our Latin America Baseball Academy bearing fruit. However, Soto is from Puerto Rico, which made him draft eligible. Regardless of how the Reds got him, it's a good thing that they did. Soto is 6'3 tall, 180 lbs, bats right, and throws right. He attended Colegio Marista High School in Puerto Rico, where he broke the youth homerun record of Juan Gonzalez. Obviously, he has a great deal of power potential. Soto made his professional debut for the Gulf Coast League Reds and acquitted himself admirably for an 18 year old. Soto got into 40 games and in 152 ABs posted a line of .303/.355/.454/.809. He hit 2 homers and was successful in his 2 stolen base attempts. His 31/11 K/BB ratio wasn't bad for a young ballplayer in his first professional season. However, his on base skills are far from ideal, so hopefully more experience will lead to a more disciplined approach at the plate. As to be expected, Soto was more effective against southpaws (.366/.409/.488/.897) than right-handers (.279/.336/.441/.778). On the positive side was that Soto got better in the more crucial situations, hitting .311/.342/.527/.869 with runners on base and .340/.370/.640/1.010 with runners in scoring position. That's the kind of situational hitting you like to see out of all your players, but it's impressive to see in a young prospect. His 2007 season was shutdown early due to minor elbow inflammation in August, but it shouldn't be of long term concern. Soto has a long, smooth swing that should generate even more power when he fills out. Not to suggest in any way, shape, or form that he has similar offensive potential, but his style reminds me a bit of Joe DiMaggio. He has a wide batting stance which provides a solid base. The wide stance limits the length of his stride, which is essentially just picking up his foot and putting it right back down. He gets good extension in his swing. For some reason, lefthanders always seem to have longer, more flowing swings, but DiMaggio had it from the rightside and I see a bit of it in Soto's swing. Of course, a longer swing can simply mean more holes for the pitcher to exploit, so it may not be such a good thing for Soto. Soto's swing is a bit inconsistent and he'll need to refine it a bit to be successful. It'll be interesting to see if more advanced competition can exploit his longer swing or if Soto can maintain his level of performance by adding strength. His strikeout totals should tell the tale. Either way, it seems unlikely that Soto will ever hit for a high average, but his power potential could offset it. Improvement in his on base skills would also help offset a low batting average, but it's too soon to tell if he'll be able to do so. You can access the link to Soto's MLB scouting video here. Scouting reports grade Soto's arm as average, but it appears to be a tick below average. He utilizes a high three-quarters motion, which can cause the ball to sail. In the field, his footwork is good, but he takes long, deliberate strides which may ultimately force him to move off shortstop. His first step quickness isn't good and bulk added from maturity will likely reduce his already borderline range. In 2007, Soto posted a .913 fielding percentage at shortstop and played 4 games at 3rd base, which may be his ultimate destination. Soto probably isn't a shortstop, but he has good offensive potential. His career got off to a nice start, but it was a fairly small sample size and he's got a long way to go to reach the majors. Ultimately, more advanced competition may expose more weaknesses and reveal that Soto isn't a blue chip prospect. There are a lot of wrong turns on the road to the majors and Soto could easily take one, but at this stage it's difficult to overlook his upside, which is why Soto gets the nod at #11. This is a ranking that's likely to be at odds with most other 2008 Reds Top Prospect Lists, but I am very high on Josh Ravin. He was listed as the #13 Prospect in Baseball America's 2007 Prospect Handbook, but his performance in 2007 may see him drop substantially on most prospect lists. 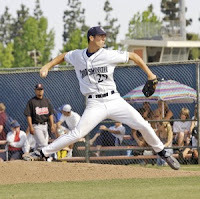 Ravin was a member of the Chatsworth High School program that won back-to-back national championships in 2003 and 2004. During his senior season, Ravin's velocity dropped to 89-91 and he was sidelined for a month with a tired arm. However, that didn't prevent the Reds from selecting him in the 5th round of the 2006 draft with the 144th overall pick. The Reds soon found out that they were getting an even better arm than he showed in high school. 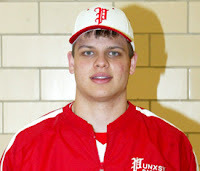 Ravin is 19 years old, 6-4 tall, weighs 195 lbs, and throws right-handed. He has almost a prototypical pitcher's body type due to his height and large frame. His height allows him to throw on a downward plane, despite the fact that he throws from a free and easy high three-quarters arm slot. In addition, his body type allows room for growth and additional projection. Ravin features a fastball that sits in the 90-94 mph range, but touched 98 mph in the 2007 season. Ravin's fastball has good movement with heavy, late life. He also features a curveball and changeup that are advanced for his age. While he has plus stuff, he has quite a bit of trouble commanding it, but he's still young enough to improve on it. Ravin made his professional debut in 2006 with the Gulf Coast League Reds, where he worked he worked 21.0 innings in which he posted a 4.29 ERA with a 1.47 WHIP and a 22/10 K/BB ratio. He had a BABIP of .386, had an OPS against lefties of .825, and an OPS against righties of .696. While his overall numbers weren't eye popping, his 3.94 BB/9 and 9.56 K/9 stats were impressive and he was promoted to the Billings Mustangs of the Pioneer League. At Billings, Ravin worked 15.3 innings and posted a 3.52 ERA with a WHIP of 1.50 and a 18/13 K/BB ratio. In addition, Ravin held opponents to a .189 batting average against in the Pioneer League. In 2007, command problems plagued Ravin in his return to Billings. He worked 40.0 innings, posting a 39/41 K/BB ratio and posting a 8.55 ERA. Ravin also dealt with some shoulder soreness, which cost him innings and effectiveness. While there isn't really any way to put a positive spin on his 2007 numbers, Ravin still possesses the tools for success. His good stuff still allowed him to strike out almost a batter an inning, but command was a big problem. Perhaps the most impressive thing about Ravin is his pitching mechanics, which appear to be almost flawless. There is a certain beauty to professional sports that can be seen when an athlete performs his task in such a way that all the parts work together as one cohesive unit. When it all comes together, the action is elevated to a place where there's an economy of movement. A certain grace and fluidity. I'm sure it differs for everyone, but I've seen it several times before, including Payne Stewart's golf swing and Joe Montana's passes. Since studying the Reds prospects, I'm surprised to have seen it twice. In Danny Dorn's swing and Josh Ravin's pitching motion. Maybe it's what baseball scouts call "the good face", but whatever you call it, I think both Dorn and Ravin have it. Not only can Ravin throw a heavy fastball in the mid-to-upper 90s, but he does it with a very easy motion and arm action. In contrast to Kyle Lotzkar, there is very little effort to Ravin's delivery, which should help reduce his risk of injury. His body control and balance throughout the pitching motion are truly impressive. At no point in his delivery does he ever seem to rush, be out of control, or out of balance. Ravin maintains an easy, consistent tempo throughout his delivery. Like many modern pitchers, he doesn't begin his windup by stepping backwards with his "glove side" (GS) leg, but rather by lifting his GS foot up and turning it parallel to the rubber. He then rotates his body and brings his knee up well past parallel and nearly to his chest. As he pushes off the rubber towards home plate, Ravin's hips move sideways with his GS hip leading him towards home plate before he completes his leg lift. This move is commonly known as the "drop-and-drive" motion. This strong hip action maximizes the force that pulls his shoulders around, but his follow through still remains in perfect balance. His "pitching arm side" (PAS) leg lands right next to his GS foot, leaving him in ideal fielding position. As a result, he can get off the mound quickly and fields his position very well. While his pitching motion is fundamentally sound, Ravin needs to improve his ability to repeat his delivery. If he can repeat his delivery, then his consistency and command should improve. You can access the link to Ravin's MLB scouting video here. Ravin had a strong 2006 debut, but struggled with his control in 2007. He has the stuff and the mechanics to be a top of the rotation starter, but he needs to harness his control in order to unlock his true potential. While his poor command is of concern, it's not a unique problem among young pitchers. In addition, it is a flaw that can be corrected. You can teach command, but you can't teach stuff. Ravin has the mechanics and stuff to be successful. It'll be interesting to see where the Reds start Ravin to begin the 2008 season. He may be returned to Billings, but the Pioneer League season doesn't start until mid June and the Reds may want to get Ravin to full-season baseball. However, if he returns to Billings, then he'd get to work with newly named pitching coach Tom Browning in the new home park of the Mustangs. A return to Billings may be a good thing for Ravin, otherwise he might get bumped up to low-A Dayton. I have to give the nod to Josh Ravin over Lotzkar due to the fact that his stuff is a tick better and his mechanics are much cleaner. Like almost all pitchers drafted out of high school pitchers, Ravin has a long way to go to reach the majors. However, his solid mechanics gives him a strong foundation on which to build and his repertoire gives him all the tools he needs to be successful. The 2008 season will be a big test for Ravin, but I wouldn't be surprised to see him take a big step forward. The 19 year old Ravin isn't currently among the best pitching prospects in the organization, but he's quickly becoming my favorite. If he can do a better job of repeating his delivery, then his control should improve, which will unlock his potential. However, if his control doesn't improve, then he'll flame out before ever reaching the upper levels. His performance next season will reveal a lot about Ravin's future, but for now he checks in at #14 on the list.